The South-East manufacturer Harvey Water Softeners has marked its 40th year in business with its best ever set of results, posting sales of £26.5m for 2017 – a 24% rise on the year before. The family-run firm, which builds and sells water softeners for homes in hard water areas, grew its turnover during the 12 months to December 2017 from £21.4m the year before, with total income up by 230% in four years. These latest figures come as its factory output grew by a third (28%) last year to meet continued customer demand, following more than £4m of investment in R&D and its production line since 2015. After posting double-digit growth for eight out of the last nine years, Harvey is forecasting sales in excess of £30m by the end of 2018, with a quarter of that coming from exports. Its senior team attributes this ongoing success to a combination of increasing consumer spending power at home, the weaker pound abroad and a growing confidence that a ‘hard Brexit’ will be avoided. 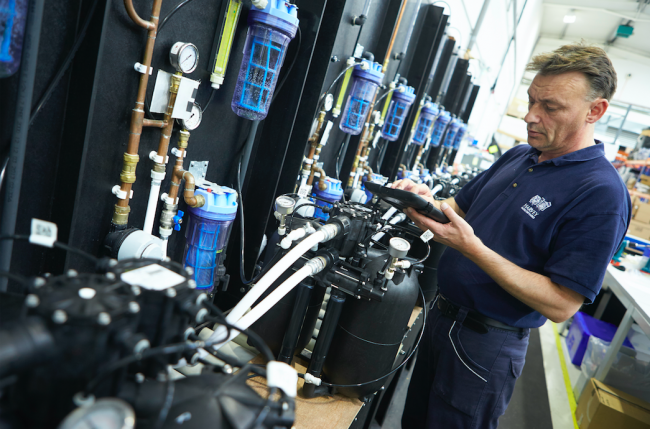 Martin Hurworth, managing director of Harvey Water Softeners, said: “It’s really pleasing to see these latest results as the investment we’ve put into our people, our products and our production lines really starts to show in our sales figures. We’re growing faster than ever, but we’re well placed to keep up with demand, breaking factory records every month for numbers of softeners made. Staff numbers at Harvey Water Softeners’ Woking headquarters grew by 50% last year. The company was founded in the town by Harvey Bowden in 1978 and is now Europe’s largest manufacturer of compact water softeners.